one-time High School Study Skills Boot Camp program. Approximately 80 students participated in Summer Study Skills programming. Students, representing all local school districts, were given opportunity to practice and reinforce these new skills during fun interactive activities. These programs were extremely popular, with each new scheduled program filling almost immediately. How to deal with classroom and test anxiety, as well as other topics. The High School Study Schools Boot Camp included all of the above topics, delving further into effective note-taking, use of apps, increased personal responsibility and internal motivation. Pre and post-tests documented a significant increase in study skills knowledge in 85% of participants. These programs were very well-received with student and parent feedback being extremely positive. As per Kristine B., a parent of one M.S. student participant, "The instructors were so nice and the lessons were well planned. My son did not want to attend at first, but ended up having a great time and looking forward to the next class. The apps were something I have never seen before, so that was great to for us to learn about." Kings Park student, Grace H., who will be entering 7th grade this month said, "I learned different ways to take notes and that the best way to succeed in school is to have a study plan." Students and parents may inquire at their school regarding the availability of this program on-site. School district personnel can email below to schedule the program for interested students. Learning about the Eight Dimensions of Wellness can help you choose how to make wellness a part of your everyday life. Wellness strategies are practical ways to start developing healthy habits that can have a positive impact on the physical and mental health of students and adults. **Learn more about the basics of SAMHSA's Eight Dimensions of Wellness in this brief three-minute animated video. Click link below. Smithtown Youth Bureau Summer Eight Dimensions programming included a "Mindfulness" workshop for youth residents living in temporary housing located in Commack. Basic Yoga poses: Standing and seated yoga poses and breathing. Guided Progressive Muscle Relaxation: Activities to demonstrate that b y tightening a muscle and then releasing, you can feel the difference between tense and relaxed. Actively engaging in progressive muscle relaxation exercises effectively loosens and relaxes the muscles. Practice at incorporating mindfulness into everyday activities and teaching how to utilize all five senses. Students enjoyed these and other activities and the opportunity to take a "Take a break and Cool Down" with Youth Bureau staff on a hot summer day. Other SAMHSA Eight Dimensions of Wellness program topics are explored in Prevention services provided in local school districts and for community groups by the Town of Smithtown Youth Bureau and Horizons Counseling & Education Center, free of charge. "Making Good Decisions and Positive Choices"
Horizons Counseling & Education Center & Smithtown Youth Bureau provided fun, educational presentations at six (6) Smithtown Recreation Playground Program sites. Participants ages 4 through 11 played interactive games meant to teach the all important life skills of "Making Good Decisions and Positive Choices"
Presentation content was from a lesson in the highly effective, research-based prevention program; " Too Good For Drugs." The objective of the presentation was to demonstrate the importance of making good personal decisions and positive choices. Students were given the opportunity to participate in interactive activities while learning helpful strategies to deal with negative peer pressure, which affects decisions and choices made. The older students engaged in problem-solving activities, encouraging them to think about how good and bad decisions have varying consequences. Researchers in child development agree that young people's lives are growing increasingly complex. As parents and educators struggle to find safe places in which their children can grow, they bemoan the fact that their children seem to be getting "older" so quickly - at least superficially. Children as young as 5 or 6 years of age may look and sound sophisticated to us, but they remain children regarding the ability to figure out how to do things and feel successful; curiosity about how their friendships, families and community work; seeking the love and approval of their parents, and trying to define their place in the world. Teaching children how to make sound, age-appropriate choices in a world that sends mixed, complicated messages about who they are supposed to be, is one of our biggest and most important challenges. A variety of research-based K - 12 prevention programs are available to local school districts and community organizations free of charge. **For information on all available Horizons/Youth Bureau Prevention Programs click the link below. September is a GREAT Time to Get Involved!!! Visit the newly updated Alliance website from time to time and see where you'll find the most current information on our Alliance, and how you and your family can be more involved in your community. Teach the Value of Community Service! On Saturday, August 19th at the Smithtown Historical Society grounds 20 student volunteers spent quality time outdoors, creating a beautiful, flowering Butterfly Garden for the public to enjoy. Student volunteers in grades 7 - 12 planted a Butterfly Garden on the Smithtown Historical Society grounds. Participants earned community service credit, while enjoying the great outdoors, beautifying their community and developing gardening skills. By the way.....The butterfly garden is still need of some Shepard hooks for hanging plants. If you would like to donate these materials call the Smithtown Historical society at 631-265-6768. GREAT JOB by our Youth Bureau Volunteer Corps members!!!!! 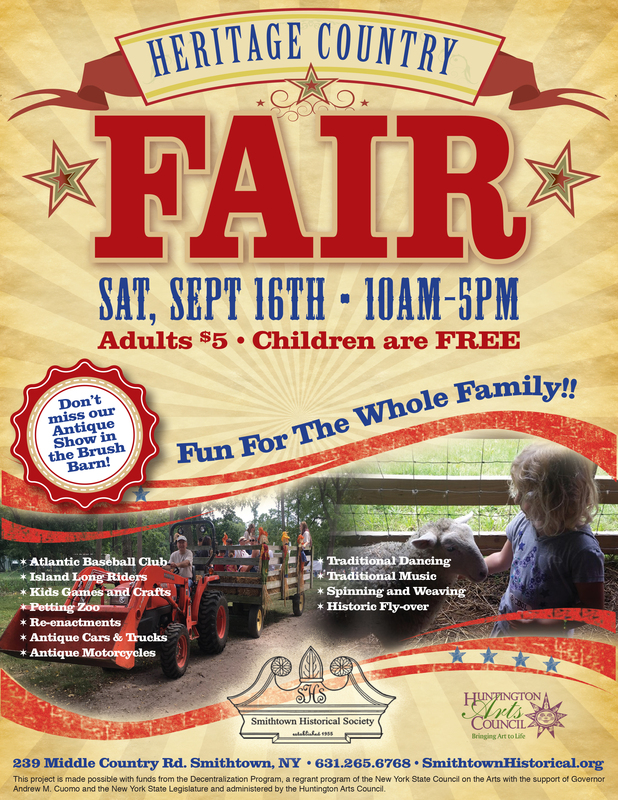 The Heritage Country Fair is Smithtown's leading Fall Festival!!! join the Smithtown Historical Society for a full day of activities. - classic cars AND all of the Historic Buildings will be open to tour. Adults are $5/p.p. and children are FREE! Please call (631) 265-6768 for more information on attending as a participant. **High School VOLUNTEERS are needed to assist with; activities in the children's area; crafts; temporary tattoos; running games (potato sack, tug of war, etc); setting up; breakdown & closing; admission gate; petting zoo; selling soda & water, etc. Town of Smithtown Certificate of Community Service is provided. See pics below of the Smithtown Historical Society's 2016 Heritage Country Fair. Comprehensive (K-12) substance abuse prevention programs are vital to deterring underage substance use. These programs meet the needs of adolescents, schools, and the community as a whole. The goal of prevention programming is to prevent or delay drug and alcohol use by all individuals and to develop the knowledge and skills needed to make both healthy and low risk choices. ( 2014-2015 Youth Development Survey ). The earlier we can educate our young people about substance abuse the less likely they are to use/abuse substance later in life. Age appropriate evidenced-based prevention programs have been proven more effective when completed continuously from elementary through secondary schools. Skills are built upon throughout the years and it encourages the norm of the school community to be that drug use is not acceptable. Having these programs within the school community also reinforces the message to young people that not everyone experiments with drugs. Town of Smithtown Horizons Counseling & Education Center and the Youth Bureau offer an array of evidence-based programs for school districts at no cost. These programs are tailored to the individual schools and can be facilitated in various ways depending on the student body and needs of the population.
" Let's Talk Prevention Guide"
Horizons Counseling & Education Center is an OASAS licensed not-for-profit agency funded to provide adolescent and adult prevention , treatment , and educational services for drug and alcohol related programs. Complete the Survey and Submit with Your Email Today! A $25 Target Gift Card!!! Your input helps us to improve upon our existing programs, and to develop new ones to meet community needs. We depend on community input.... PLEASE click on the links below to participate. The survey only takes a few moments. Thank you!!! include their email address at the end!